M.L. 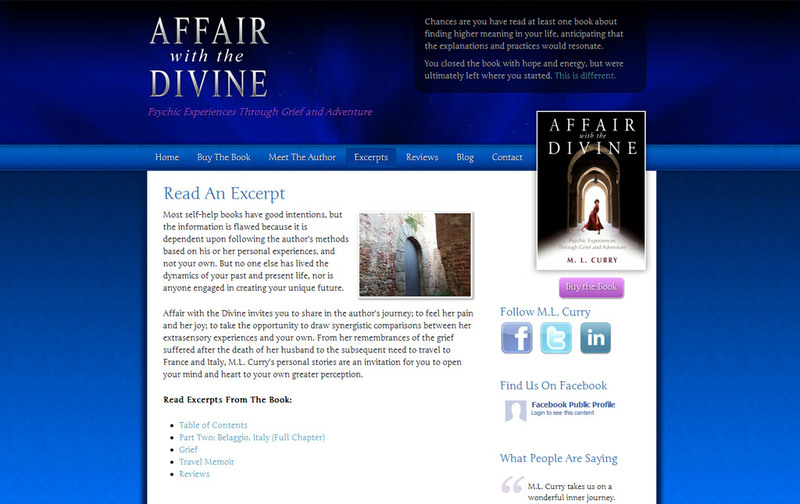 Curry is an author and has written Affair with the Divine, a very personal account exploring the dichotomy of pleasure and joy as she experienced through the passing of her husband. The book ultimately invites readers to open their hearts and minds to a greater view of perception. M.L. is requesting an updated, more inviting web presence to showcase her book. M.L. came to Design SEO Hosting to design and develop a new website for the Affair with the Divine book, integrating the design aesthetics and characteristics as suggested by M.L. The completed website is clean, with easy site navigation and ethereal appeal – focusing on the metaphysical nature of the book. The site is an information portal through which individuals interested in Affair with the Divine may obtain information regarding excerpts, inspiration, engage in discussion and find out how to purchase the book. Site visitors are also be able to connect with M.L. directly via social media or contact forms. Visitors to the site have access to a blog containing content and media added by M.L. including a “behind the book” section, as well as thoughtful discussions on supernatural phenomenon.